This year’s stunning raffle quilt is ‘Under The Milky Way’, made by Sydney Modern Quilt Guild for the 2018 QuiltCon Charity Quilt Challenge. We’re very pleased to announce that the profits form this years raffle will be donated to Illawarra Women’s Domestic Violence Court Advocacy Service (IWDVCAS) and will help fund safety and emergency items. The Illawarra Women’s Domestic Violence Court Advocacy Service (IWDVCAS) works with women and their children in the Illawarra who are experiencing domestic violence (DV). Most of our work is received through direct referrals from NSW Police where a woman is identified as being a victim of DV. Women are contacted following a reported incident and our highly skilled workers offer support, risk assessments, safety planning, information and referrals to a range of services. We support women at all stages of their journey upholding our main objective, to keep people safe. Our clients are diverse in all areas, including age, socio-economic needs, education, cultural background, and other needs. They are affected by violence from partners, ex-partners, children, siblings, other residents in their dwellings and a range of other family members. Their experiences are varied and their needs differ greatly. Funds raised through your efforts would go directly to practical safety measures that we have found to assist women. These measures include items such as: personal safety alarms, door stop and window alarms, locks for gates and letterboxes, dummy cameras, sensor lights and safety planning resources. We would allocate a portion to food, petrol and mobile phone credit vouchers to assist women that have fled their homes in a bid to keep themselves and their children safe. If possible, we would also love to offer some financial assistance to women with pets to assist with boarding through programs like RSPCA’s Safe Beds for Pets. Raffle tickets are now on sale and will be available at the Sydney Stitches & Craft Show, February 14-16 2019. They’re also available from members of Sydney Modern Quilt Guild, Wollongong Modern Quilt Guild and soon will be available for purchase online. We can also arrange to send out booklets for anyone interested in selling some. This entry was posted in Quilt Show News on February 13, 2019 by wmqgadmin. Our committee has been working hard behind the scenes organising the details of the show and we can’t wait to share them with you. Our new posters and flyers are ready, you can download our A4 Poster or DL flyer to print and share with your groups, family & friends. This entry was posted in Quilt Show News on February 6, 2019 by wmqgadmin. We’ve published some information to help you in preparing your entries to Modern Quilt Show Australia 2019, including our Terms & Conditions. Below are some of the highlights, please visit the website to read the full Entry Requirements and Terms & Conditions. Entries open on Saturday 11th May 2019 and close at 11:59pm Sydney time on Monday 17th June 2019. There is no entry fee for junior quilters (18 years and under). 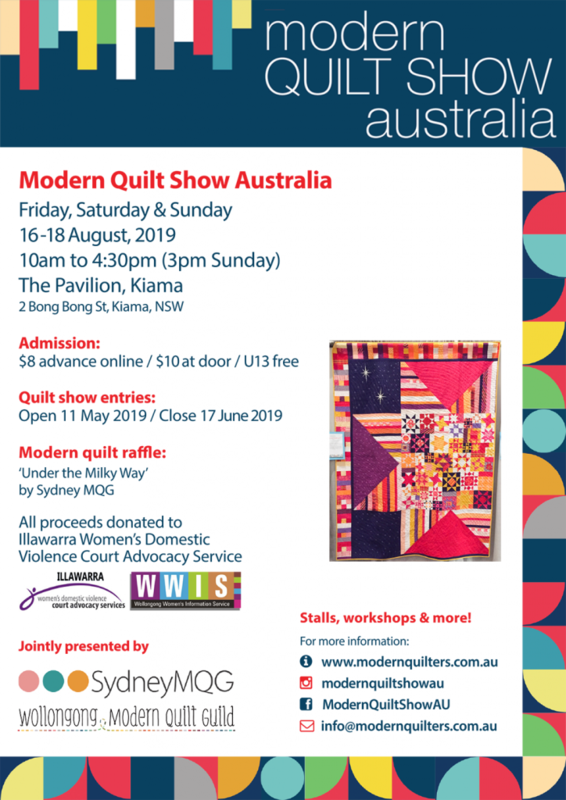 $15 for members of any of the Australian Modern Quilt Guilds that are affiliated with The Modern Quilt Guild and for individual members of The Modern Quilt Guild. The entry fee allows for the entry of 2 quilts, as well as any group/collaborative quilts the entrant has worked on. Maximum quilt size is 240cm in height and not more than 240cm in width. In the Small Quilts category the maximum sizes are 100cm in height and 100cm in width. Modern quilts made by three or more people. Quilt is pieced improvisationally (without the use of a defined pattern or templates). Quilt design incorporates a creative or significant use of negative space which is integrated into and/or organizes the composition of the quilt. Quilt design incorporates the use of an identifiable traditional block pattern and modernises it by applying design elements such as alternate grid work, asymmetry, colour, scale, etc. A modern quilt fitting into one of the above categories, where no side of the quilt is greater than 1 metre. Modern quilts made by a quilter 18 years or under, this also includes quilts made by Year 12 students in 2018. This entry was posted in Quilt Show News on February 5, 2019 by wmqgadmin. Key Dates for MQSA 2019! Time to start sewing! Modern Quilt Show Australia is back again in August 2019. We’re returning to our beautiful venue in Kiama and are hoping to see you and your quilts there. Below are the key dates for your diary. Stay tuned for more information to follow on entering quilts, sponsors, stalls, workshops and more! 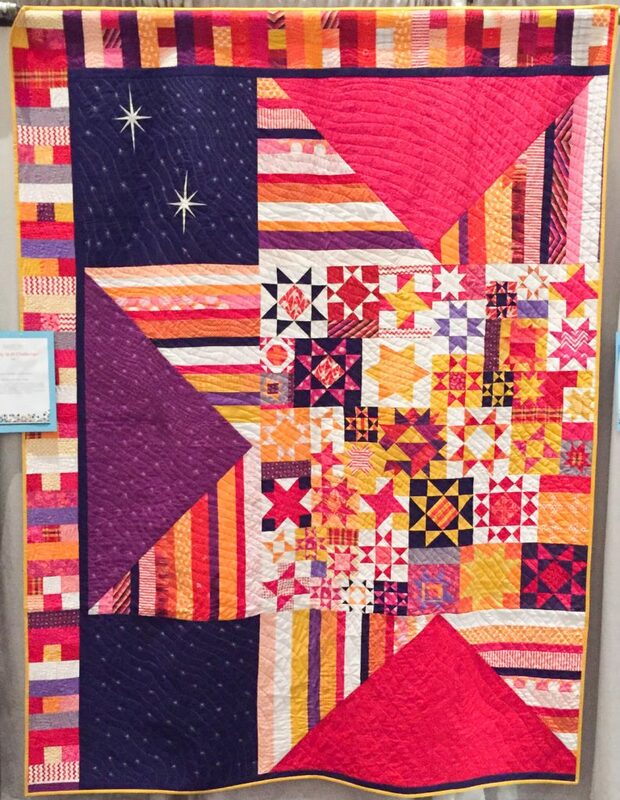 This entry was posted in Quilt Show News on December 2, 2018 by wmqgadmin. Error: Error validating access token: Session has expired on Thursday, 31-Jan-19 03:34:54 PST. The current time is Tuesday, 23-Apr-19 09:36:27 PDT.